Thank you round-up champion, Laura Salas, Writing the World for Kids. Her original poem last week, Lunch in a Refugee Reception Center, is powerful. It's National Kite-Flying-Day! Aren't kites grand? My library partner, our assistant and I love kites so much that we spruced up our middle school library ceiling with kites from around the world. I went looking for a kite poem to share today. And, I found lots! Kites inspire poems. After looking at lots and lots, this one is a new favorite. Today I watched a boy fly his kite. gave out a barely perceptible hum. In response, I looked up Kites at Wonderopolis --where I found some haiku neatly tucked into the non-fiction paragraphs. from the Library of Congress, <www.loc.gov/item/2015645221/>. O wind, that sings so loud a song! O blower, are you young or old? Or just a stronger child than me? I didn't know there was a "National Kite-Flying Day", Linda. How wonderful that you & your colleague filled the library with them. I have a wonderful box kite that we take to the beach every summer, & I've flown it with students, always makes special memories. "There's something about a kite. . ." And your poems, yes, beautiful. That first: "a tiny/bird in mid-air courtship." and Stevenson seems to find the images for our vision. Thanks for all, & Happy Kite-Flying! Beautiful tribute poems for National Kite Day. Surprise to hear it's National Kite Day (I thought it was in March). What a fabulous celebration, Linda. Love the library decor as well as the poems. Joy! In love the way you celebrated National Kite Day, in your library and here with these gorgeous poems. I do love kites! Your haiku are a wonderful addition to celebrate Kite Day! Linda, you should share what you wrote about Wonderopolis & your haikus that followed at Twitter with the hashtag @Wonderopolis on #WonderWednesday. Nice work! Ah... kites, too! I ran across a fun site that lists every kind of "Day" you can imagine. 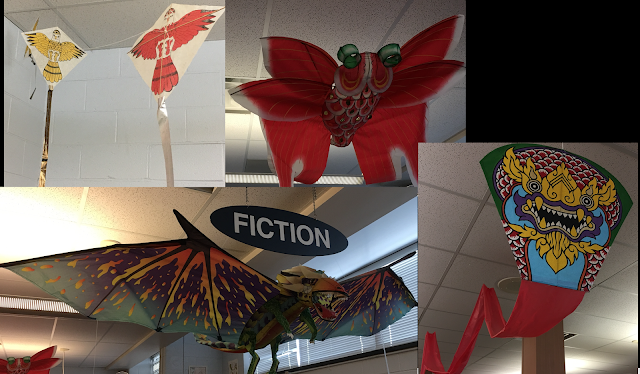 Love your wonderful display of kites in your library. And I love the old photo you found. It makes me remember some childhood days. This post soars like the kites it celebrates! Each time I think I found the high spot, I read on to another one. That final photo is so evocative. Thanks for sharing and for reminding me that I have some kite photos in my archives that might be in search of a poetry companion. These are great! And how fun to pick a topic and see what you can find. 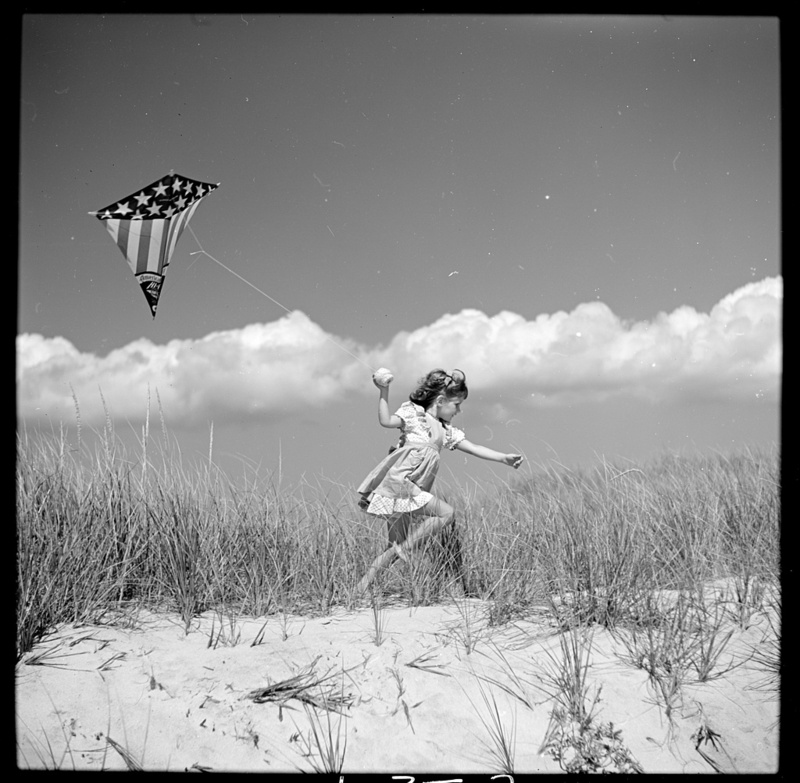 What a wonderful collection of kite poems and images! Thanks for sharing, Linda! Kites always make me think of childhood and spring. Hooray for kites! Kites as decorations are a terrific idea! Found haikus also. From the Beveridge poem, I especially like this detail: "make it veer with the precision of/an insect targeting a sting"
Thanks for sharing all these kite poems and images. There is something magical about kites. And I have to admit, I still think of Mary Poppins when I think of kites. I love the Beveridge poem you shared--especially the surprise ending! I like the refrain in the Stevenson poem. And what a mysterious ending the Beveridge poem has. I love your kites from around the world-how inspiring, thanks Linda! I loved reading the haiku especially the first one. "The Kite" You are right about the ending - thinking UK/EU located with (spoiler alert) alms & a monk? Appreciations for this intro to a new poet/poem. And - such a jubilant photo from the LOC! at your school. Great collection you high-fliers launched! Friendly, positive comments and feedback are always welcome here. Please let me know I'm not just whistling in the dark!